Albert ‘Einstein’ Tumenov had geared his whole life toward soaring to the heights of the UFC’s Octagon. 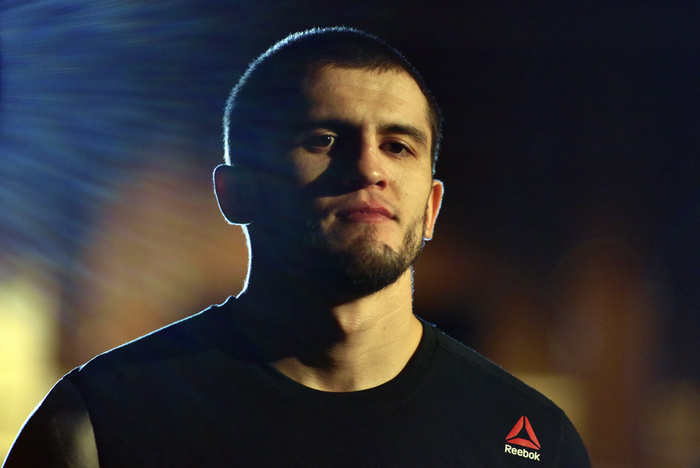 Just 22 years of age when he finally made his first walk to the infamous structure, the Russian prodigy had only been in the professional ranks for six years, but he already had a martial arts pedigree that would put the majority of veterans’ to shame. The patented punch that led him to known as ‘Mr. Left Hook’ has been in development since he was six years old when his father and coach, a Master of Sports specializing in boxing, introduced his young son to the sweet science and karate. After five years dedicated to those disciplines, Tumenov moved on to hand to hand combat, a field he would go on to claim two national titles in. Like his father, he went on to claim a Master of Sports degree in boxing, as well as another in hand to hand combat. Initially, the stopping power Tumenov has been celebrated for didn’t translate as emphatically as it has in his later career. Although he won his first pro bout with a first round knockout, he would only claim one other stoppage in the five bouts he contested in his first year as a pro. Like a lot of greats, one of his big learning curves came when he tasted his first defeat, a controversial decision loss against Murad Abdulaev. ‘Einstein’ rebounded with eight straight wins, seven of which came by knockout, with six of the victories coming in the first round. 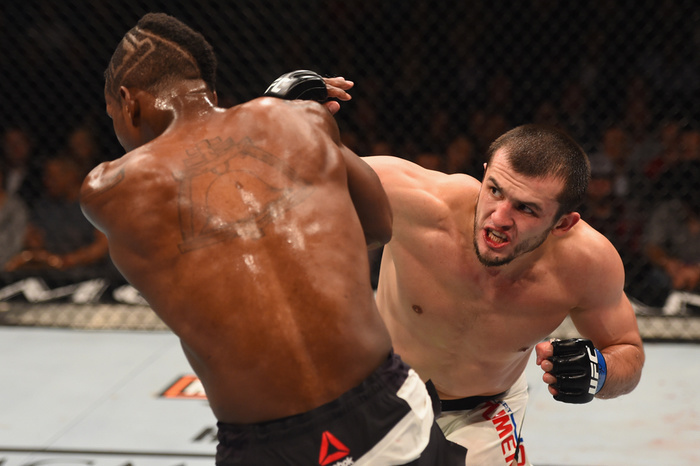 The spell of dominance that followed his first loss would lead to his UFC contract. Fresh off a move to New Jersey that coincided with his Zuffa signing, Tumenov beamed on his way to the Octagon followed by his father in Barueri, Brazil in February 2014. His willingness to make a big impression was obvious as he loaded up on his shots. After three rounds, Ildemar Alcântara had his hand raised having weathered the storm of the dangerous Russian. It must have been an anticlimax for the young man, but again, he made sure he learned from the experience, which has been evident in his five bouts since his UFC bow. Three months later, in Ohio, Tumenov displayed a far more measured approach when he fought Anthony Lapsley. From the word go the wrestler didn’t hide his pursuit of a takedown, but after one solid connection from Tumenov’s left the American couldn’t hide the effect of the blow. In the final trade-off, such was his reluctance to exchange that he visibly leaned back in an effort to avoid the shots. They still came, and with less than a minute remaining on the clock, Lapsley was rendered unconscious by Tumenov’s left. His next outing against Matt Dwyer proved that the skillset of Einstein wasn’t only effective against grapplers. Towering at 6’4’’, Dwyer took a 7-1 record into his debut against the Russian with all of his victories coming by knockout. Dwyer’s aggression was his downfall though as two left head kicks ended his night in less than a minute. In his next outing three months later in January 2015, Tumenov banked the first win of a twelve-month spell that would see him crowned ‘Russian Fight of the Year’, which is no mean feat given the success of his countrymen in the sport. Niko Misoke troubled ‘Einstein’ with shots to the body in the first round, but Tumenov picked him apart over the last two rounds with a stellar jab, his power right and a series of vicious combinations. When Alan Jouban was slated to meet the Russian, it was unknown as to who would hold the advantage in the striking realms. Again, a right head kick from Tumenov brought the debate to and end in the first round of the clash. Another challenge from a fellow spectacular striker was called for afterward. Although Lorenz Larkin certainly left with the majority of style points for his flashy techniques, the judges awarded a split decision in favor of Tumenov after the final bell sounded. Tumenov faces the most significant test of his young career when he meets another European welterweight who has been turning heads since his teenage years at UFC Rotterdam, Gunnar Nelson. While Nelson’s prodigious grappling ability separated him from the field on his ascent, he shocked the world by flooring Brandon Thatch with a combination before submitting the celebrated kickboxer when they met at UFC 189. A win over ‘Gunni’ will open the door to the higher echelons of the division for the 24-year-old, but Nelson certainly won’t lie down for him. Having never been finished in his career, the stoic Mjolnir man is no easy task for ‘Einstein’. Coming off a loss to Demian Maia, Nelson will be more determined than ever to steady the ship this Sunday night at the Ahoy Rotterdam.